If you are looking for some spice but tasty chicken and veggies, look no further. Here we have an incredibly easy recipe for chicken and vegetable skewers marinated in cilantro, lime and cumin, and served with rice, salsa, and warm tortillas. Sounds mouth-watering indeed. Let’s get crackin’! HOW TO MAKE IT: In a small bowl, mix the following ingredients: olive oil, cumin, chopped cilantro, and lime juice. Season with salt and pepper. Add chicken to the mix, and mix well. Cover, and refrigerate for an hour and a half (longer is ok as well). Thread onto skewers the following: chicken, zucchini, onion, red bell pepper, and tomatoes. Apply some oil onto the grill and arrange skewers on hot grate. Grill until chicken is cooked through (approximately 10 minutes), turning every once in a while so it will cook evenly. And voila! 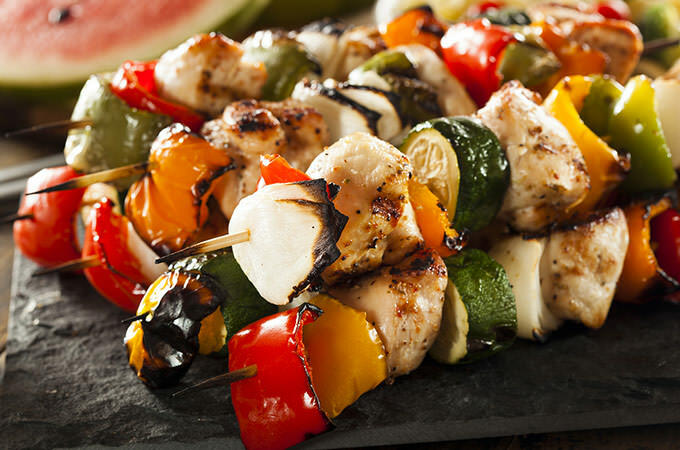 The Delicious Chicken Kabobs – Mexican Style are ready to be served. OPTIONAL: We suggest you have some cold beer with this delicious meal. Note: this recipe was originally published on allresipes.com.